Perhaps the fundamental challenge in analyzing this year’s Republican nomination race is the unusual divergence between the popular support for the various candidates, as can be measured through opinion polls, and their support among the party establishment, as can be measured through endorsements. So far this year, Mitt Romney has received about 55 percent of the endorsements from Republican Party and elected officials and his share has been trending upward. However, he is only at about 19 percent — and headed downward — in the polls. Conversely, Newt Gingrich is at about 27 percent in the polls (or perhaps higher, if the most recent surveys are any indication). But he has only about 5 percent of the endorsements. As Jonathan Bernstein notes in The Washington Post, Republican elites are reluctant to nominate Mr. Gingrich, and they have become somewhat more vocal about it in recent days. The magnitude of this discrepancy is historically unusual — perhaps even entirely unprecedented in the era of the modern primary (from 1972 onward). You can conduct any number of statistical tests of the relative importance of popular support and elite support in explaining the winners of past primaries. But these tests are beset by two major problems. First, we have only a small number of cases to work with — somewhere from 12 to 16 competitive nomination battles depending on how you define the term. Second, these two variables have been highly correlated with each other in the past, making it almost impossible to separate out cause and effect. At some point within the next few weeks, we may be bold or foolish enough to put out some type of statistical forecast of the Republican race that accounts for both variables. But no matter what we do, we will have to make a lot of assumptions about what’s really going on. There’s just no way around it when these two statistical properties hold. My disposition — you can call it a “bias” or a “Bayesian prior” if you want — is to tend to place more rather than less emphasis on polls. This is not because I think that polls are all that reliable — they aren’t all that reliable, especially in primaries. Rather, it’s because I worry that every other type of indicator will be worse — less robust to changing circumstances, and changing attitudes and priorities among voters. At least with polls, we are allowing voters to tell us for themselves what they think about the candidates. One thing, meanwhile, that would give me pause about the idea that Republicans will eventually line up behind whomever the party establishment wants is that they have become less and less trusting of political and societal institutions over time. I looked up data from the General Social Survey, which has been conducted roughly every other year since 1972, and which has had a longstanding series of questions about how much respondents to the poll trust different types of institutions, like Congress, the Supreme Court, the news media and the military. 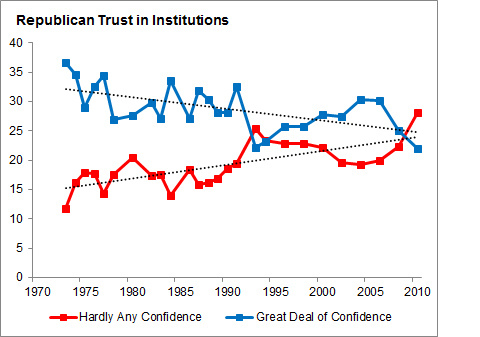 For each institution, respondents could say that they had a great deal of confidence in it, some confidence in it, or hardly any confidence at all. I then averaged the responses across the 13 institutions that the survey usually asks about. Republicans are sometimes thought of as the party of the establishment. But the party’s leadership has spent much of the last three decades cultivating distrust among its rank and file about the legitimacy of these institutions, particularly the government and the news media. This may have contributed to the party’s electoral successes. But it’s also possible that Republican elites have neutered their ability to influence how voters decide on a candidate. If so, they may end up with Mr. Gingrich rather than Mr. Romney.